When guided effectively, the relationship between adolescents and music can offer powerful opportunities for expression and release. This book provides music therapists with the complete 'how to' of working with teenage clients. Helpful and accessible, the book explains the methodology used in music therapy, a topic that has been considered only briefly until now. The author presents an empowering approach to practice, discussing how the therapist can be placed in a collaborative relationship with the individual or with the group. A range of strategies is explored, including song sharing, improvisation, song writing and various multi-media approaches. Some of the key challenges faced by music therapists working with adolescent clients are addressed, including the constantly changing repertoire and evolving musical tastes, and the author offers practical solutions for overcoming these. Contemporary models of Community Music Therapy are outlined in the second half of the book, and case vignettes illustrate how each of the methods can be applied in practice, and the outcomes that may be expected. 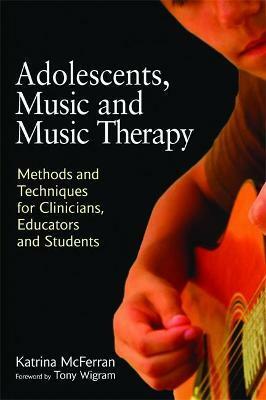 The first of its kind, this comprehensive book is a must for all music therapists working with adolescent clients.